For the last two years or so, I have been on a quest to read some of the classical literature that I missed reading when I was in high school. I took two years of literature in high school and really enjoyed it, but I felt I missed some of the other great stories out there. Yes, I made it through Dickens, but David Copperfield was not the best one to read of Dickens, I would say. And I missed half of Jane Austen’s fabulous works in there somewhere! Needless to say, I decided to try and dig a little deeper into the amazing world of classical literature. Ivanhoe had been on my TBR list for some time before I finally got the enormous book from the library and started in. I had pretty much no idea about what I was getting myself into except that it was set in England. When I got done, I was more than pleasantly surprised with the story! I loved it! If you have never read any of Sir Walter Scott before you might not recognize this book. I didn’t, though it is considered one of the first historical-fiction type books ever written. Sir Walter Scott wrote during the late 1700’s and early 1800’s and would be what we call now days a “best-selling” author. He wrote many of his books around Scottish history since that was where he was from and people loved his works. Some of his most famous stories and poems include The Lady of the Lake, Rob Roy, Waverley (of which there are several novels), The Talisman and Ivanhoe. Ivanhoe takes place in England during the crusades. There are knights and ladies, castles, forests, tournaments and Templars. If you love that time period, you will love this book! 🙂 Also, without giving to much of the story away, I really enjoyed the way Scott included a certain man in Lincoln Green in the story. That was a surprise I was not expecting! One of the most fascinating aspects of this book to me, was the way that Scott was able to smoothly incorporate different cultures, religions, beliefs and practices into his book. Because the book takes place under Norman conquered Saxon England, you get to feel the two different cultures at war with each other in the way that Scott describes their language, dress and habits. The Normans spoke French and the Saxons spoke a form of English and they both had vastly different ideas on proper behavior! Also included is a Middle Eastern flavor since some of the main characters are Jewish and bring with them their customs and language and the crusades and the Holy Land are mentioned often. So, how about you? 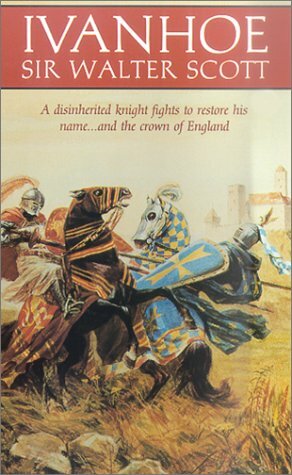 Have you ever read Ivanhoe before? What did you think about it?